The 13th prime minister of the second republic of Armenia Hovik Abrahamyan will shift from a legislative position to an executive, as an “old veteran” who had already served in the executive field various times before as a Minister of Territorial Administration, vice-PM, Governor of Ararat Province and Mayor of Artashat. Abrahamyan, 56, is originally from Mkhtchyan village in Ararat Province. He started his career at leading positions as department head of Burastan Brandy Factory, and later as the president of Artashat wine-brandy factory. He made his first steps in the legislative body in 1995 as an MP of the first Parliament. 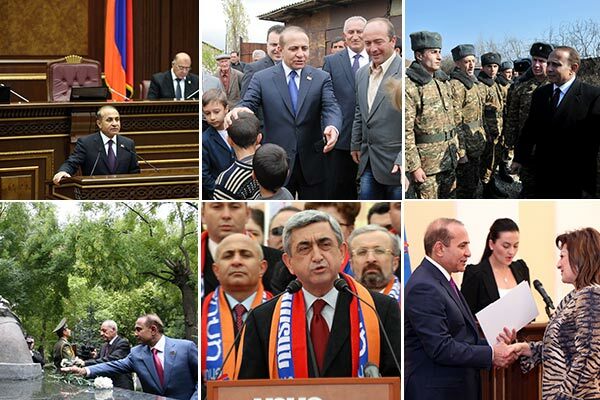 During 2008 and 2012 presidential elections Abrahamyan led candidate Serzh Sargsyan’s election campaign and later on was appointed the secretary general of the presidential staff. Abrahamyan’s rise in politics was accompanied by controversy when, in 2008, he was among others named in Wikileaks’ publication of secret communications. In a private letter to the U.S. State Department on October 29, 2008, the then-US Ambassador Marie Yovanovitch wrote that Abrahamyan is one of the republican politicians who uses his political power to promote his business interests. In a separate Wikileaks document, Abrahamyan was described by tycoon Mikhail Baghdasarov as being the real power at the seat of the Government. In a conversation with Deputy Chief of Mission at the US Embassy in Yerevan Joseph Pennington, the owner of Armavia Airlines told the U.S. diplomat that Abrahmayan “shouldn’t be underestimated, he has already managed to form a “shadow government” in the Parliament.” According to Pennington (again in 2008) “Baghdasarov assumed that Hovik Abrahamyan will become the future PM of Armenia, and eventually Armenia’s President”. Although according to 2006 declaration of property and income Abrahamyan has 53.24 hectares land for agricultural purposes and four units of real estate in Yerevan, the public is well-aware of his house that is a scale replica of the Parliament building built on 2,500 square meters land in the capital city, in the neighborhood of Victory park. In 2010 Russian “Vek” journal in its “Armenia’s Thieves – 2” series mentioned that Abrahamyan (whom detractors have nicknamed “Mouse”) owns more than two dozen companies – three sand mines on Araks river, 1,500 hectares of grape fields in Artashat, more than 10 gas stations outside Yerevan, one third of “Araratcement” stocks, casinos, petrol stations, and a $7 million summer home in Crimea. The new Prime Minister is the father of three and grandfather of seven.